ISEA2013 and Tin Sheds Gallery present an investigation of electronic art and architecture – disSentience, curated by Lian Loke; The Generative Freeway Project, a participatory installation by Matthew Sleeth; and Transpotage, a living installation by Spanish architectural duo Selgascano – which together will form part of the Emergen/City project. DisSentience speculates on a future where digital technology has pervaded all aspects of daily life, infiltrating even the most mundane and intimate of domestic rituals. The home as we know it, as a refuge for the self and family, is peeled apart to reveal our complacent acceptance of the invasion of technology into our everyday domestic routines and interactions. Every action we make is surveilled by the prying eyes of networked digital technologies, embedded in domestic products, furniture and architecture. The lines between public and private, convenience and infantilisation become ever more blurred, as digital sentience and solicitude take over human agency, outthinking, outwitting and outperforming us. Ollie Bown is a researcher, programmer and electronic musician interested in live electronic music performance, computational creativity and machine autonomy. He performs and records in a number of electronic and electroacoustic ensembles, with a focus on the realtime control of generative software elements, and autonomous software interacting through sound. Significant performances include the Bimhuis, Amsterdam, the Sonic Acts Festival, Amsterdam, The ICA, London, the AudioVisiva Festival, Milan, and the Dana Centre at the Science Museum, London. His interactive sound design has appeared in works at the Kinetica Art Fair, London, Club Transmediale, Berlin and the Future of Sound Tour, throughout the UK. He has also conducted research into the evolutionary psychology of music and the arts, using simulation models to study relevant evolutionary dynamics. Christine Cynn & Valentin Manz have collaborated on numerous interactive installations incorporating audience participation, large-scale sculptural environments and multichannel video installations (earthNOWbeing 2011; Bread Head with Campbell Works 2011-present). Christine Cynn has been developing new ways to catalyse and document the human imagination in order to illuminate the conflicts of desire, fear, and hope that shape our lives and our world. She is co-director and co-producer of the award-winning documentary The Act of Killing (2012) with Joshua Oppenheimer and Anonymous, with executive producers Werner Herzog & Errol Morris, recipient of the Panorama Audience Award, Berlin International Film Festival 2013; Danish Film Academy Award for Best Documentary; Copenhagen DOX:AWARD 2012; Movies That Matter Human Rights Award 2013). Cynn studied film with Dusan Makavejev and Chantal Akerman at Harvard University. Valentin Manz’s work engages viewers visually and physically in a sculptural theatre made from glass, metal, clay, and found materials such as cardboard and furniture. Manz has been a fellow at Urban Glass in Brooklyn (2005) and the Creative Glass Center of America (2007 & 2013), and shown his work in London, Munich, and New York. He studied stage design at the Slade and Central St. Martin’s College of Art, and graduated from Goldsmiths as an art psychotherapist. Christine and Valentin are both based in the UK. Possessing both a doctorate in psychology and an accomplished ability in the pugilistic arts, Michaela Davies can perform a complete emotional dissection while delivering a near-lethal series of devastating blows. When she’s not busy reducing people to physical and emotional pulp, Michaela unwinds by creating performances which involve subjecting participants to extreme feats of endurance and public electro-convulsion, along with other less ethical preoccupations. Her work has received support from a number of august art and science institutions and festival organizers that were all simply too frightened to say no. Also an unrelenting force on the bass guitar, her path is littered with countless musicians who have been bludgeoned into submission by her treacherous headstock or coruscating remarks. Alexander Jung is a thinker and designer of Architecture; he was trained as draftsman, and worked internationally in Italy, Netherlands and Germany for large architecture companies. Jung received the Taut-Price, a distinction of the BDA Germany, in 2002 which was followed by the BDA MAX40-Price in 2010 for the Jones House. He was part of UN Studio (van Berkel und Bos) between 1998 and 2004. Jung currently teaches Architectural Communications and Master of Digital Architecture at The University of Sydney. Lian Loke pursues an interdisciplinary creative practice across performance, installation and technology, with the body as a constant theme. She is a Senior Lecturer at the Design Lab, Faculty of Architecture, Design and Planning, University of Sydney and co-founder of the Pork Collective, a group of artists working in performance installation in festival environments. She is currently training in the Bodyweather system of dance with De Quincey Co and has performed solo works in Platform 1 (2010), Platform 3 (2011) and 6 Women Dance (2013). 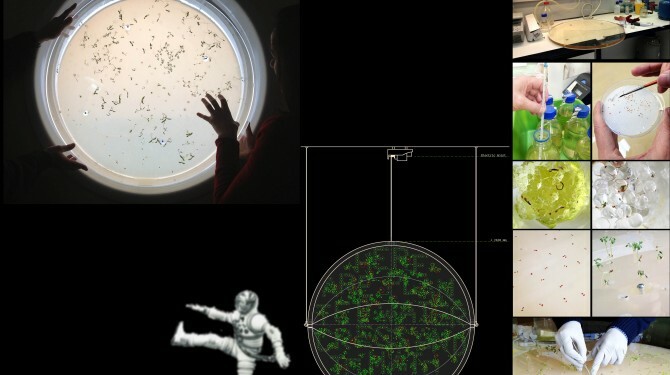 Recent creative research collaborations include The Black Project and Gold with Dagmar Reinhardt, a series of works exploring new choreographic approaches to the intersection of bodies, computational materials and interactive, spatial environments. Louis Pratt predominantly works as a sculptor using new technologies. He focuses on capturing and manipulating “organic data” (data captured from life), by using laser scanners, software and 3D printer to works. This process started in 2002 with his MF studies at COFA in new technologies for sculpture. In 2005 he built the first open source 3D additive printer in Australia. Most recently his sculptural work Whatever was shown at the Wynne Prize 2012. Paul Warren is one of Australia’s most experienced Directors of Photography. With over thirty-five years of experience shooting in the broadest range of cultures throughout the world, his portfolio is extensive and displays a huge variety of formats, styles and content. His knowledge and ability to cross between the different demands of long form feature films, documentaries and short films is formidable. This gives him a rare and versatile approach for the many ways of finding the appropriate visual dialogue for the story at hand. Paul’s first feature film ‘The Cup’ was in Official Selection for the prestigious Directors’ Fortnight at the Cannes Film Festival. His latest feature, ‘Wrath’, currently being released worldwide, is another example of his versatility in working with demanding stories and locations.His understanding of all the current formats and their impact on the story from pre-production right through to post-production is invaluable. He also teaches specialised digital camera courses at AFTRS. Paul is also a dancer. He has been dancing Argentinean tango for the past twelve years. “… Tango by its very nature is an improvised dance relying on connection, intuition and generosity within the embrace, and demands of its dancers, openness to the intuitive moment to create a ‘dialogue’ within the embrace”. PW. … Very much like his working life. Paul is a member of ‘The Conductors’ a performance group, embodying a restless search for combining different media and disciplines. Their most notable collaboration was based around time & space, performed at Carriageworks in Sydney as part of the ‘Expanded Architecture’ festival. This self-generating work – “part robot, part performance and part durational kinetic installation” – populates itself over the exhibition period by way of a prototype 3D printer. 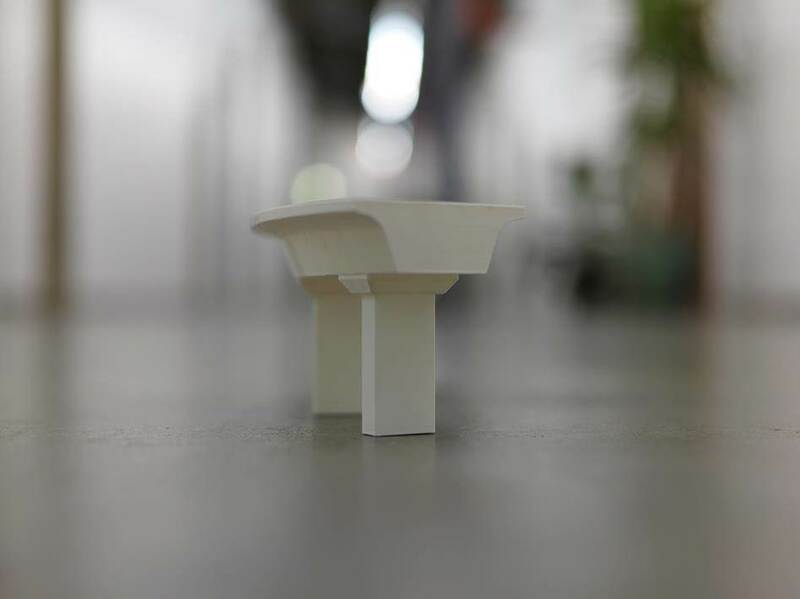 A new ‘component’ for a model of a freeway system is ‘printed’ every 30 minutes, and is then placed on the gallery floor by visitors as directed by the artist; by the end of the exhibition the system will cover the gallery floor. By rendering visible the process of making and assembling the sculpture, the performative nature of the installation is embedded within the work. Situated within the traditions of kinetic sculpture and durational installation, this work also has a close relationship to performance in its direction of participants’ physical movement through time and space. The Generative Freeway Project takes the freeway – a central infrastructure and key cultural metaphor of our society – and extends the allegory by using its intersections to draw attention to the chaos, confusion and constant movement of our world. Matthew Sleeth lives and works between Australia and New York. 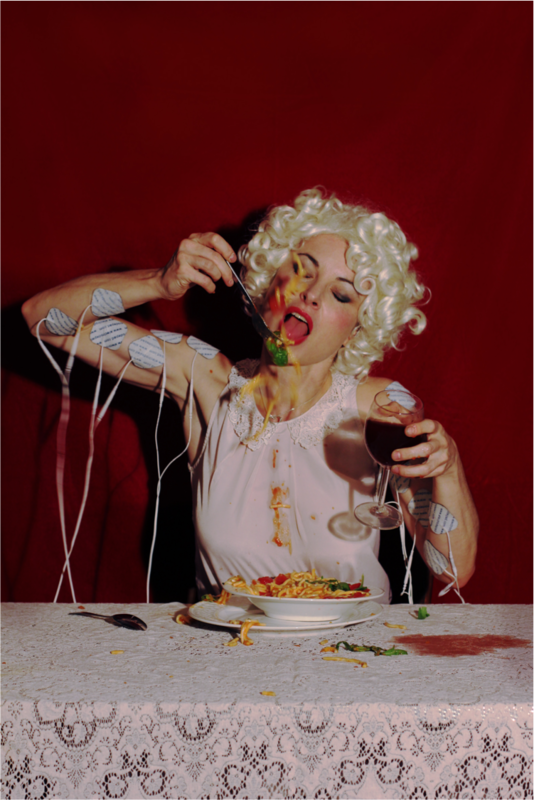 His practice encompasses a range of media, including photography, video, sculpture, printmaking and installation. His works are concerned with “representation, mechanical reproduction and art made by machines” and he has a particular interest in systems and process. Transpotage – a Moveable and Translucent Garden is the second phase of an ongoing laboratory project which borrows new technologies from other disciplines and transfers them into the sphere of architecture. The first phase, at the Venice Architecture Biennale (2012), explored the lightness of the substrate and movement; here the focus is again on these two issues. The lightness of the substrate is taken to an extreme by making it translucent; meanwhile movement, although simplified to one direction, is also made more perceptible, as the translucency of the substrate reveals the trace of its effect on growing roots. 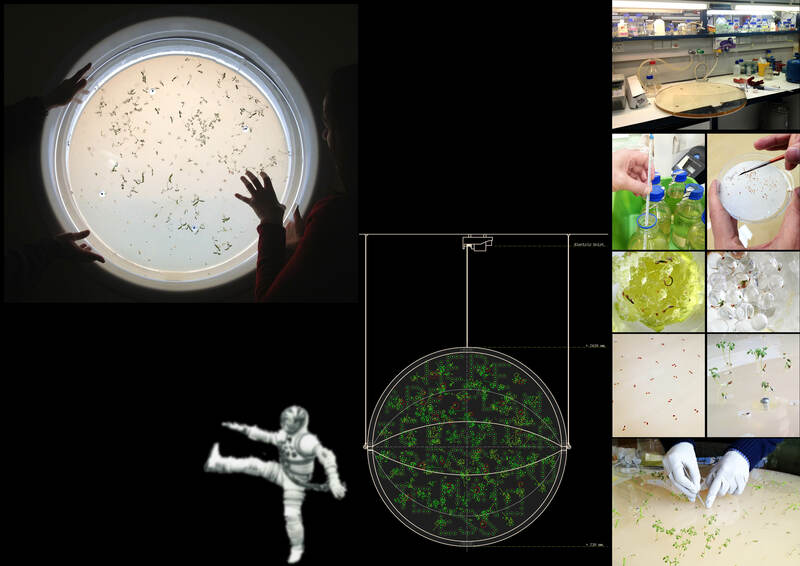 Selgascano are working on this project with the Spanish National Centre for Biotechnology (CNB) and the Plant Genetic Engineering Laboratory (PGEL), the University of Queensland, and biologists Antonio Leyva, Carlos Alonso and Jimmy Botella. Selgascano (José Selgas and Lucía Cano) are a small architectural atelier based in Madrid. They have exhibited at MoMA and the Guggenheim (New York), the Venice Architecture Biennale (2012), GA Gallery and the MOT (Museum of Contemporary Art), both in Tokyo, and the Design Museum, London.